When I came across this quote, I pinned it immediately for two reasons. The first is that for most of my life, and presently, I make it a point to be open-minded. I strive for an open-minded. Even when I have my own beliefs and my own opinions, that doesn’t mean I won’t hear you out (it’s a personality trait we INTPs tend to have 😉 ). And with open-mindedness comes the lesson this quote is teaching, that everyone has something you can learn. If you close yourself off and judge someone without cause, you lose the lesson. What have you got to lose by giving everyone a chance? Even if it turns out you cannot be friends, there’s something that someone can teach you. As this quote says, there is something to be learned from everyone. The second reason I pinned this quote immediately is that I love the idea of being wise. From an early age, I realized that wisdom doesn’t mean knowledge and vice versa. I couldn’t tell you exactly what that difference was back then, but the question I asked myself when I learned these two words was “why would you use wise instead of knowing? It is two different words so two different meanings.” And since I learned the difference, I have always made it a conscious effort to strive for wisdom and not just knowledge. 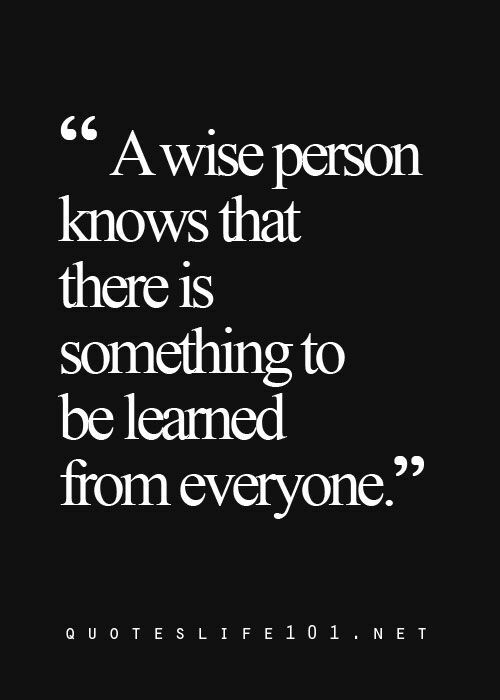 So, let’s strive to be wise by realizing that there is always room to learn more and that could start with the next person that crosses your path.